Training has progressed well. I have basically followed the marathon program to the letter, which has meant three months of record volumes of running, topping out with 300km during March. The long runs have continued to be my Achilles heal, always being nervous ahead and not being able to fulfill them all. For a while I bonked out every two weeks needing pick up from my wife to make it home. This has probably been due to a combination of over training, stress and cold temperatures during the run, and sometimes I have not had the mental motivation to finish of the last few kilometers as I got tired. Despite this, I have finished seven runs over 30km, compared to only three 30km+ runs last year. Feeling in my legs is also better, last year I tended to get really tired in my quads after 20km, this year I have been able to push it to 30km without to much pain, which I take as a good sign. Pace on the long runs have also been slightly faster compared to last year, varying between 4:45-5:05 minutes per kilometer, some 5-10 seconds faster compared to 2017. So happy after my final long run!!! When it comes to injuries things have stayed smooth, despite an almost 50% increase of running volume compared to last year. Since a month back I have started to get some pain in my Achilles tendons – typical signs of running too much. It has not stopped me from running, but I have made sure to re-focus again on the calf exercises, now twice per day, as well as regular massage every two weeks. Thankfully now as tapering has started and running volume is going down ahead of the race, the tendons are starting to come back to pain free status. I will continue with my calf strengthening up to this weekend, and then have a rally easy last week coming up to the race. Long winter - running indoor has been a key for volume and consistency! Despite a good training record I am not entirely confident in my abilities compared to last year. One small detail is that last year I had much higher total volume of training ahead of the marathon as I spent a lot of time on the bike on top of the running the last two months ahead of the race, which gave me a solid aerobic base to use. But the main difference is my heart arrhythmia that is acting up on basically every run nowadays, something I didn’t have as much last year. It is for sure making my running efforts much tougher, and as it seems to start very early in my runs now I am in serious doubts if I will have the stamina to run fast for an entire marathon with the arrhythmia acting up. I have therefore started the process to lower my mental ambitions for Boston, in case I have a tough day. Training has been both very physically and mentally tough at times with a long and cold winter that upped its ante in March. Balancing this I’ve had the joy to be part of a Boston Marathon training group on Facebook. When I joined in November we were around 700 members, but that has increased to close to 2000 people. It has been great to be able to post and share pictures and stories from my own runs and read, follow and be inspired by everybody else following the same journey but with different angles. 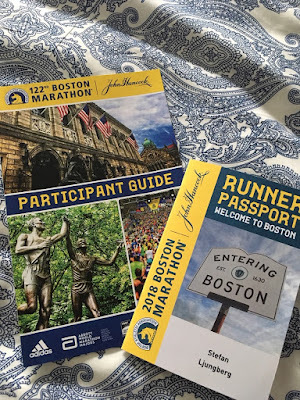 Everyone has their own story and reasons for running, but we all have in common the awe and pride at being able to run the 122nd Boston Marathon in April. Obviously, it can become stressful at times to read about everybody else’s workout and compare with what you do on your own, and here it is important to believe in and stick to your plan. Extra nervous for me as my plan seems to have been a low volume plan and where runners with same ambitions as me has been putting in almost 50% more volume… I really hope to be able to meet up with a few of them when in Boston, there is a meet up at the famous Cheers bar after the race that I hope to be able to go to for at least a short while. This group took over my Facebook flow for a few months... Great peeps! 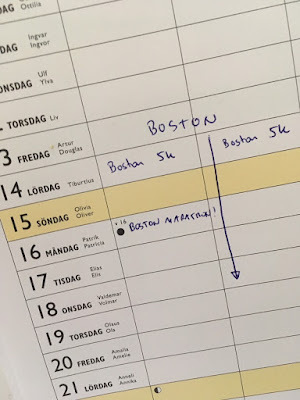 So what is the Boston race plan then? The race is on Monday April 16th, so me and my wife Sandra will travel over to Boston on Friday 13th. Sandra’s sister lives in Boston, so all the logistics around lodging and transport is taken care of in the best of ways. On Friday as we arrive after lunch, the plan is to go to the marathon expo and pick up my bib and buy more unnecessary stuff that is Boston branded. On Saturday morning me, Sandra and her sister Marcela will run the Boston 5k race. I actually plan to make a really hard effort to go under 19 minutes, it would set a PR for me, and it’s always fun to run fast. I hope the short but intense effort will not be detrimental ahead of the marathon two days later… On Saturday afternoon we will drive the marathon course so I can get a feel of the hills and undulations in real life. I know it by heart already after having read through course descriptions and blog posts many times, but seeing it with your own eyes is always good to be prepared. Sunday is an open easy day with probably some touristing, and then we have the race on Monday morning. We return back to Sweden on Tuesday night, so we have one extra day in Boston to relax before boarding the plane. It will hopefully be a great weekend! New shoes for the marathon - I stay with Saucony Kinvara a while longer! For the race itself I have set up three goal levels for the race: 3:08 or better, 3:10 or better (this was my original goal), running in training pace (will give me a 3:25ish) and just finishing. The 3:08 goal requires an average pace of 4:27 min/km, 7 seconds faster than my Stockholm marathon in 2017. The Boston course is unique. First of all it’s a point-to-point race, starting west of Boston in the town of Hopktinton and then running eastwards to Boston. So wind is definitively a factor, with westerly winds you for sure get an extra push, and on the contrary with easterly winds. Secondly, it is a downhill course with a total drop of around 150m. Actually the first 5 kilometers is predominately downhill, so it is very easy to go out too fast and burn up your legs early in the race. Important here to not get overly exited and push the pace to much, it should be really easy and relaxed running in the beginning. Thirdly, you have the Netwon Hills, a series of four moderate hills with approx. 20-30m incline, between kilometers 28-32, with the last one called Heartbreak Hill for a good reason. Go out too fast in the downhill sections in the beginning of the race and you will for sure pay the price here when you anyways normally are tired after 30k of running. From the top of Heartbreak Hill it is slightly downhill into Boston, so if you have something left in your legs you can push the pace here again and make up for some slow kilometers uphill. Nutrition wise I’ll do a normal carboloading routine two/three days ahead. For race day I will bring with me a bottle of Maurten 320 to the start area to top of with liquid and energy ahead of the race. During the race I will take five gels, on every seven kilometers. There is water and Gatorade all through the race, so depending on temperature I will ingest liquid as well, I normally tend to need very little to drink during running, but let’s see. Temperatures in Bostin mid April can be anything from 5C to 25C with normal around 13C, so I will try and run in shorts and a singlet for this race. Probably need some arm warmers and thin gloves as well if chilly. I’ll give it a 25% chance I can make it under 3:08-3:10, 75% chance I make it under 3:25 and a 25% chance that I wobble in on some other time, admitting defeat. Needless to say, I will be proud anyways if I just finish the iconic Boston Marathon and get my unicorn medal. I know I have done everything I could during the training, pushing myself well beyond my limits at times and setting new personal records when it comes to training volumes & distances, speed sessions, hill intervals and sheer discipline. Knowing I could not have done more on my own, now it is just time to see if what I did was enough for my ambitious goals! Boston bound - all in! Hopkinton, Wellesley scream tunnel, Newton fire station turn, Heartbreak Hill, Citgo sign, Massachusetts turnpike underpass, right-on-Hereford-left-on-Boylston... Soon I'll be there!